Last week Clutch published the first edition of its research on Digital Marketing Agencies located in the United Kingdom, and identified Redweb as being one of the leading agencies. The research is Clutch’s latest in a series of reports identifying agencies worldwide, as part of the research Clutch asked some of our clients to provide a quote and score, we received a rating of 4.8 out of 5, scoring highly in references, clients and experience and our market presence. The analysts at Clutch conducted a thorough examination of digital marketing firms in the United Kingdom. We were selected based on over a dozen quantitative and qualitative factors, including company experience, industry recognition, technical certifications, market presence and positive client reviews. The research leverages the proprietary Leaders Matrix mapping the different agencies focus on digital strategy, design and marketing against their ability to deliver world-class results for their clients. Companies are plotted on the matrix based on their proven ability to deliver and focus on a service type. Clutch is a Washington, DC-based B2B research and review firm that identifies top service and software firms in the technology and marketing industry. The Clutch methodology is an innovative research process melding the best of traditional B2B research and newer consumer review services. 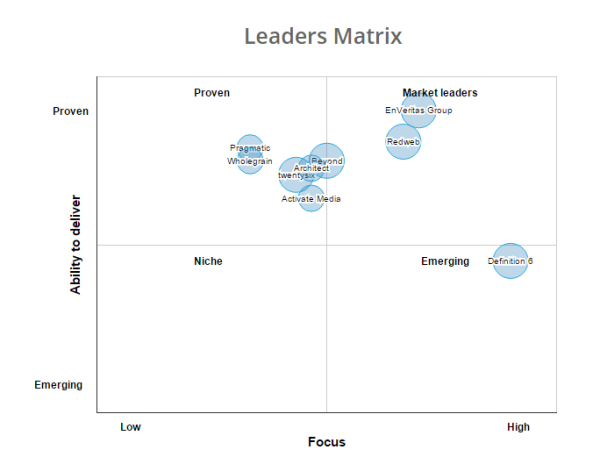 Clutch utilises a proprietary framework, the Leaders Matrix, which maps firms’ focus areas and their ability to deliver on client expectations. Clutch publishes the leading research on mobile agencies in addition to research and reviews covering 900+ companies spanning 50+ vertical markets.